The DB7 i6 has a 24 valve, twin cam, 6 cylinder engine of 3.228cc, equipped with an Eaton 'Roots' type Supercharger. The 5 Speed Manual gearbox is from Getrag, the Auto is a 4 speed from GM. The DB7 Vantage was introduced in March 1999, Chassis No. AA300001 on. The DB7 Vantage had a 420hp, 48 valve, single cam per bank, all alloy 5935cc V12 fitted, this was largely a Cosworth modular design. Many of the basic parts are Jaguar, be careful though as minor detail changes have been specified. For this reason we have our own DB7 parts lists, made up from information that we have gathered over a period of time. Remember our prices on these pages include VAT @ 20%, if you are a resident outside the EU this tax is not charged.  Lagonda Rapide Parts | Four Ashes Garage Ltd.
Not always related to cars but!